Security on the Internet is fundamental to avoid fraud and maintain privacy when you browse over the great web. To restrict the access to certain pages or applications it is usual to use passwords that are hidden behind asterisks. But, in general, users choose the option to remember the password so as not to have to input it each time. In these cases, even though they are still hidden, it is very probable that you will forget them after a long time without having to write them down. If this is what has happened to you, you can use Password Spectator to recover the password. 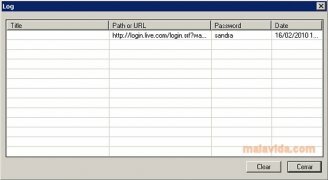 Password Spectator is capable of discovering, in three simple steps, the password hidden behind the asterisks of any application. To do so, open the application that you want to discover the password of, press the "Ctrl" key while you move the mouse over the asterisks and, last of all, press the left button of the mouse. At that movement, a window will appear with the recovered password. If you have forgotten the password of your email or Spotify account, you still have a possibility to recover it, try out Password Spectator. This application doesn't work with certain programs.